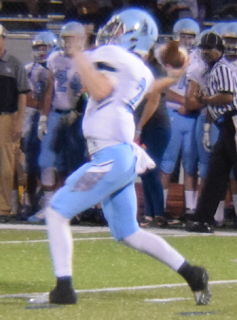 ▴Shawnee Mission East (3-1) - Despite just barely losing to Rockhurst in Week 3, the Lancers rebounded in the best way when they manhandled Olathe North 48-13. The Lancers didn't seem to eager to vent any frustrations from the loss as they methodically cruised through the Eagles' defense and a rivalry match against SM North this week should help the Lancers show off their abilities even more. ▾Olathe North (1-3) - Unlike the first two weeks where the Eagles seemed to be lacking in effort, a lack of speed and strength spelled doom for ONHS. Blowout losses to Blue Valley South and SM East exposed huge holes in the secondary and that could spell doom for the next few weeks. ▴ Lawrence (3-1) - Getting crushed 28-7 by Lee's Summit West isn't pretty, but the Lions rebounded just like SM East by running over the Vikings (2-2) 49-19 with 283 yards rushing. ▾ Sunflower League (0-11) - Good golly that was bad. It's hard to imagine that anybody truly thought the Sunflower League would just walk over a stack Suburban League slate, but to not win a single game in Week 3 is the most humbling gut punch to Kansas football. Granted, some teams like SM East and Olathe East stayed in the game the entire time, but SFL teams lost by an average of 14 points; a sign of how much room there is for improvement. Olathe North's secondary last Friday. The Lancers put themselves in the best position to win out of all the SFL-Suburban games even though they failed to finish the game on top. They showed the rest of the league that they still shouldn't be messed with and an 7-1 record isn't out of the question for this team. Out of all four teams left on SM East's schedule, the Lions are the only ones that seem to have a real chance at an upset at this point in time. The Lions trashed the next best bet last week (SM West) and should roll against what seems to be the bottom half of the Olathe schools before going up against the big bad Lancers and Free State for the regular season finale. A 5-3 record isn't out of the question, but barring any truly horrible showings, Lawrence might be the best 5-3 team out of the bunch. We can now confirm that the Firebirds can dominate lesser competition. They ran the show against SM South and Northwest in blowout wins. Unfortunately, the team failed to come out on top twice against teams that have at least one win. Fortunately for them, their next three opponents are a combined 3-9, so there is a lot of time to prepare for the season finale against Lawrence High. So much for that hot start to the season. The Vikings offense has been a shell of its former self the last couple weeks, scoring less than half of the numbers put up in weeks 1 and 2. It's still a safe bet that they will enter their season finale with SM East with a 5-2 record, but that defense will have to plug up the holes if they want to at least slow down that Lancer offense. I give in. The Indians deserve a little respect for winning big against Lansing and they could've easily taken out ONW last Friday. I give them a 5% chance of beating SM East this week, but a winning record isn't out of the question for this season assuming they can keep up the offense. If the defense can improve at least a little, this team can easily ride the offensive production of QB Will Schneider (1163 Pass Yds, 12 TD's, 3 INT's). What is even happening in Olathe? I've seen all the schools play and I can't tell who to put where. I still think the city ranks above the bottom Shawnee teams, but they're all equally bad right now as shown by Olathe East barely scraping by the ONW and then getting barely beat by Olathe South two weeks later. We can't even decided on a true city champ because they don't all play each other. Just like rival ONW, Olathe South managed to get its first win. However, that win came against in-town rival Olathe East. That means Olathe schools only have a single win against opponents outside their own district. Really, the Olathe schools are all essentially the same rank until further notice. I want to believe Eagles have more to them than the performances they put up against SM East and Blue Springs South, but it seems that the defense just doesn't have the speed necessary to keep up in the passing game and to close down the edge. Running up the middle seems almost pointless against this team as almost every run outside the box gains at least seven yards. Leavenworth also notched its first win last week... against SM South. Baby steps. It's kind of mean to press anymore about this team considering the incredibly small roster. With the whole issue with players leaving, an 0-9 season is the best we can hope for barring an upset against SM Northwest (0-5). SM West Vikings Tim Callaghan 100 WINS !! !